What changes in the steel industry Donald Trump will make are still unknown. What’s clear is that the new president-elect made trade, manufacturing and the steel industry a cornerstone of his agenda. Stocks of American steel companies soared last week as investors hope that a Trump-led government will boost domestic infrastructure, which could be a boom for steel demand. In addition he has stated he would institute more measures to protect domestic steel producers. Dow Jones U.S. Steel Index hits a two-year high. Source:MetalMiner analysis of @stockcharts.com data. A good benchmark for steel prices is the Dow Jones US Steel Index, which tracks major steel producers around the globe. Following the election, the index rose sharply to the highest levels in two years. The stocks of US steel companies are linked to domestic steel prices. This powerful price increase hints to a rebound in steel prices. 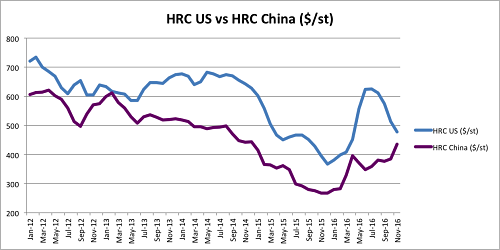 HRC and CRC prices in China continue to rise. Source: MetalMinerIndex. Chinese demand from infrastructure and construction has been robust this year. So has its auto sector, a key industry for steel demand. The Caixin manufacturing PMI for October rose to 51.2, the highest reading since July 2014 and betting market expectations. Vehicle sales in China increased 27% year on year in September, reaching the highest figure so far this year. U.S. HRC versus Chinese HRC. Source:MetalMinerIndex. Prices in China are at the highest levels in two years while U.S. prices have fallen. As a result the international price arbitrage has come down to normal levels. Cold-rolled coil is still $162 more expensive in the U.S. than in China, but domestic prices for hot-rolled coil are just $43 higher than in China. To conclude, higher prices internationally will make it a lot easier for U.S. mills to justify a price hike. 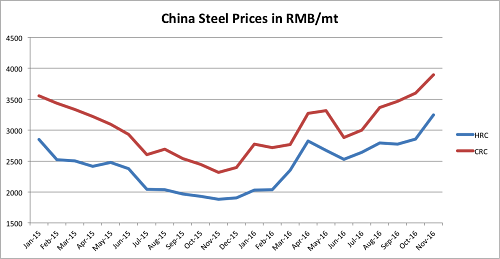 Another reason to expect a rebound in steel prices is the ongoing price strength across the metal complex. We are witnessing powerful moves across the board. Even copper, a metal whose fundamentals didn’t look appealing, recently rose near 20% in a matter of days. The bullish sentiment across base metals is another reason the expect a rebound in steel prices. Earlier this year, steel buyers had a good opportunity to lock in purchases at low prices. We expect to see another good opportunity to buy steel soon. Steel buyers need to closely monitor domestic prices, to understand the right time to hedge/buy forward.